. Cysts develop in the bone adjacent to the replacement. If these become large the implant can become loose or subside. Some implants have a much higher incidence of osteolysis than others such as the old AES. The exact cause remains unclear although it is likely to be multifactorial. Small asymptomatic cysts do not require treatment just observation. Larger cysts however may become symptomatic. The safest treatment is to remove the implant and convert the replacement to a fusion. Sometimes the cysts can be bone grafted but this is usually only successful in a 1/3 of cases. A successful fusion with an intra medullary nail. 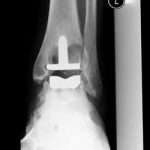 Following a total ankle replacement you should have regular x -rays to check for osteolysis. 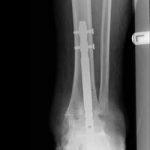 The x-rays show an ankle replacement with marked osteolysis around the tibia. The replacement was removed and a successful fusion performed with an intra medullary nail.